Pinball Fantasies is a cool realistic pinball sim with a varied selection of tables to fire the realistically-moving ball around. After you've got used to the slightly awkward controls, you'll be away in a definite pinball fantasy. Un gioco infinito, per quanto qualcuno possa storcere il naso sul numero "esiguo" dei tavoli a disposizione. Personalmente mi sono divertito dedicando le mie attenzioni (per settimane) ad un solo ed unico tavolo. Questo approccio probabilmente sminuisce il lavoro svolto dal team dei Digital Illusions, ma accresce, e non di poco, l'esperienza di gioco, regalandovi una padronanza altrimenti difficilmente raggiungibile! Avete un CD32, dovete avere Pinball Fantasies! I'm not saying this is as good as the real thing, because I don't think that it is, but I really don't see how you could get any closer. If you own a CD32 at this early stage, this is the first of what we hope will be many essential purchases for the machine, and you really should have no hesitation in buying it. Tilts, scrollings très fluides, diversité des couleurs, bref tous les ingrédients sont réunis pour vous donner l'impression de jouer avec un véritable flipper, de plus les touches du joypad sont plutôt bien choisies. Les inconditionnels des jeux d'arcade ne pourront qu'être ravis par Pinéal fantasies, les autres pourront toujours y jeter un coup d'œil. L'ambiance, surtout si vous jouez à plusieurs, est garantie! 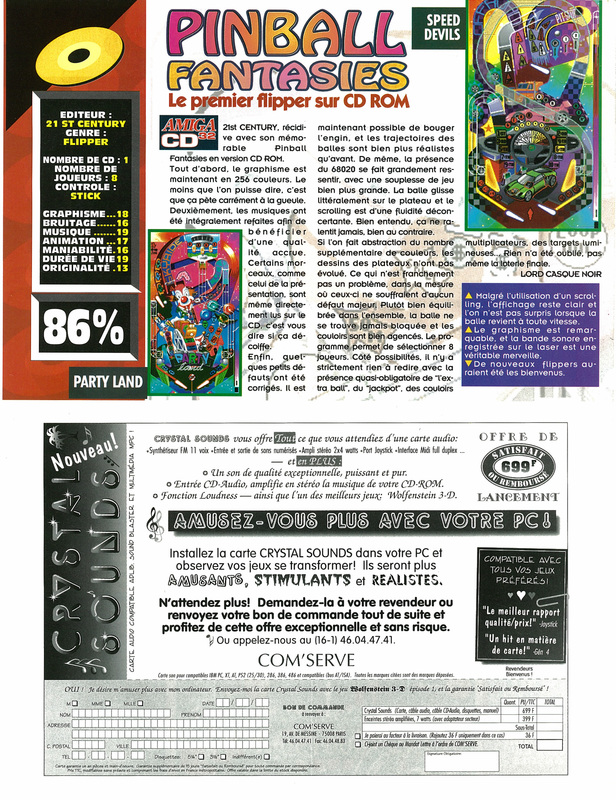 Seuls petits regrets: il est impossible de réduire le nombre de joueurs et la boule du flipper reste silencieuse lors de ses déplacements! Mais, bon, on ne peut pas tout avoir! 21st Century have taken a brave step by making sure that Pinball Fantasies is one of the first CD32 games. It won't grab people while they're browsing through Dixons like, say, Microcosm will do but in-store demos are likely to shift the game by the box-load as people realise that this is probably the closest they'll ever come to actually owning a pinball machine that doesn't guzzle fifty pees at a frightening rate. Almost indistinguishable from the ordinary game and no special use of the CD32 at all, and a bit steeply priced given the format and the age of the game, but still currently the best thing you can play on your CD32. In fact, Pinball Fantasies is so realistic if you have a pint of lager and a tab you would almost think you were in the boozer. The only complaint I could find is that there are no new tables to play. If you have never played Fantasies before this title is well worth inserting your money in the credit slot, but if you have already got it on the A500 I am not sure you will be able to justify it. Plutot bien équilibrée dans l'ensemble, la balle ne se trouve jamais bloquée et les couloirs sont bien agencés. Le programme permet de sélectionner 8 joueurs. Coté possibilités, il n'y a strictement rien à redire avec la présence quasi-obligatoire de "l'extra ball", du "jackpot", des couloirs multiplicateurs, des targets lumineuses... Rien n'a été oublié, pas meme la loterie finale. All in all, though, Pinball Fantasies is much the same as the standard Amiga version. This is no bad thing, of course, if you happen to like the original. Even so, this is not a true example of what the CD32 is capable of. It would have been nice to have seen more tables, perhaps both Pinball games rolled into one package. Still, it is a great game by any measure, and one of the most addictive the CD32 will see for a while. There are only two blots on this shining star of a game. Firstly, there is the excessive price. £32.95 is simply too much. What happened to lower prices on CD products? And secondly, and closely related, there is no reason why all four of the Pinball Dreams tables could not have been put on this disc as a bonus. There is no chance Pinball Dreams will ever stand alone as a CD32 product in the wake of Fantasies. For this tightness on the part of the publishers, this 95 per cent game gets downgraded a full 10 per cent. 21st Centurys Digital-Flipper hat schon am Computer Maßstäbe gesetzt, auf Konsole ist er absolut konkurrenzlos: Vier tolle Tische in 256 Farben, nette CD-Musikbegleitung, eine astreine Steuerung und höchst realistische Bewegungen der Kugel machen das 69 Mark teure Game zu einem Klassiker! In Zahlen: 83 Prozent belohnt. Das Pinball-Duett von 21st Century Entertainment entwickelte sich auf Amiga und PC zu einem der meistverkauften Flipperspiele aller Zeiten. Nun legt das schwedische Programmierteam eine ansprechende, aufgemöbelte Version für das CD 32. Die Grafiken glänzen nun in 256 Farben und der Sound ertönt in CD-Qualität. Da rollt die Kugel! Prinzipiell ist eigentlich alles gleichgeblieben, bis auf drei Unterschiede. Der erste bezieht sich auf die Steuerung. denn nun kann man nicht mehr die Finger bequem auf der Tastatur ruhen lassen, denn eine solche gibt es ja für das CD-32 (noch) gar nicht. Mit dem Steuerkreuz aktiviert man nun den linken Flipper und mit einen Knopf den rechten. Zeigt sich dies als recht ungewöhnlich und gewöhnungsbedürftig, so versuchen ein CD-Soundtrack gehobenen Kalibers und ein bißchen aufgepeppte Grafiken darüber hinwegzuhelfen.